Société du Grand Paris and Île-de-France Mobilités (IDF Mobilités) have chosen Alstom to develop and supply a fleet of new trains for metro lines 15, 16 and 17 of the Grand Paris Express rapid transit system. The contract is fully financed by IDF Mobilités and is worth up to €1.3 billion, covering a maximum of 1,000 cars (183 trains) in three and six-car configurations. IDF Mobilités’ board approved the first tranche of €680 million to cover the acquisition of the first 53 Grand Paris Express trains on July 11. The firm part of this contract awarded to Alstom covers the delivery of 150 cars (25 six-car trains) for a total amount of more than €280 million. These high-capacity, steel-wheeled metros will be able to circulate at speeds of up to 110km/h in automatic driverless mode, taking the form of six-car trains on Line 15 and three-car trains on lines 16 and 17. IDF Mobilités president Valérie Pécresse said the new trains “symbolise the modernity and dynamism of Europe’s leading economic region”. Based on Alstom’s Metropolis platform, the new metros have walk-through carriages and three large doors on each side to decrease boarding times. Each train will be able to transport up to 500 passengers in its three-car version and up to 1,000 passengers in its six-car version. 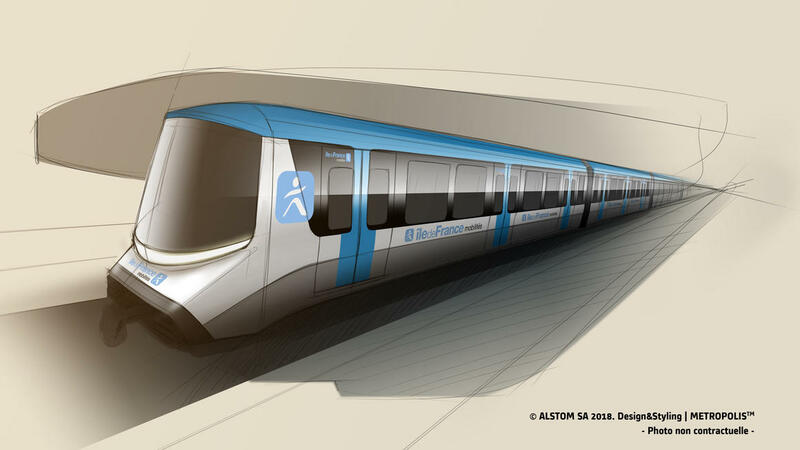 In total, 350 Alstom employees in France will be working on this project. More than 1,150 jobs will be secured in France for the country’s rail sector as a result of the project, according to Alstom. The first trains will leave the factory from 2022 onwards and enter commercial service in 2024. Alstom chair and CEO Henri Poupart-Lafarge said: “We are very proud of the renewed confidence of Île-de-France Mobilités and the decision of Société du Grand Paris to award this new contract to us. Oh a rail contract in France going to a French company how unusual…..